Charlotte Says is the prequel novel to the fantastically creepy Frozen Charlotte. I thoroughly enjoyed the first book and had very high hopes for this one, luckily the book managed to meet them! Although not quite as scary as Frozen Charlotte, Charlotte Says still absolutely delivers on everything I was hoping for. There is plenty more action from the creepy little dolls, a spooky old school house, little girls who are almost as creepy as the dolls, death, murder and so much more. The book flipped back and forth between the present (1910) and the past (18-6 months previous). I liked how this built some tension in the narrative as my brain frantically tried to make the connections between the past and the present. I also really liked how later on in the book I was able to make links to Frozen Charlotte and although this meant I kind of knew what was going to happen, it was still satisfying to read the conclusion. There’s no doubt in my mind that these are two of the best YA horror novels I’ve read (granted I may not have read many). They are creepy and spine tingling without being too terrifying to read. 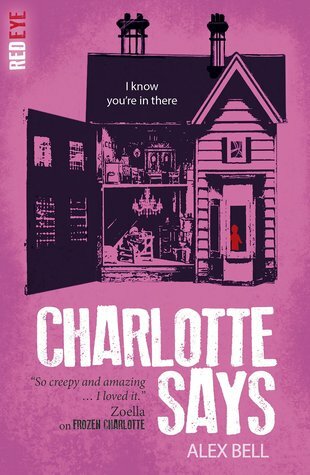 I devoured Charlotte Says in just two sittings because I simply couldn’t put the book down. I know I’ll be looking out for more from Alex Bell in future! Thanks to NetGalley, Stripes Publishing and Alex Bell for my advanced copy in exchange for a fair and honest review. Have you read Frozen Charlotte or Charlotte Says? What YA horror books do you recommend?